iTunes 12.2 is out. The new version of iTunes is rolling out for Mac and Windows PCs ahead of iOS 8.4 released and OS X Yosemite 10.10.4 update for the Mac. 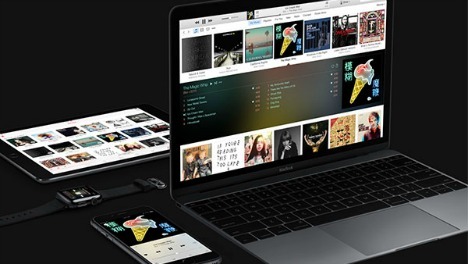 iTunes 12.2 comes with support for the new Apple Music, Beats 1 global Internet radio, and includes bunch of exciting features. Apple music content is available in the Music section of iTunes with added New Music and Connect to the top of the section where users can check out additional materials artists such as lyrics, photo galleries, behind-the-scene videos, additional recordings and more for easy access to all music. To enjoy Apple Music, iOS users need to install iOS 8.4 on iPhone, iPad, or iPod touch. iTunes 12.2 is avaiable for Mac and Windows PC. For Mac users, just simply open the Mac App Store and head to the Updates tab. While for Windows users, just launch iTunes on Windows PC, select Help > Check for Updates in the menu bar. Or alternatively download iTunes straight from Apple here. Connect. A single place to connect with your favourite artists. See thoughts, photos, music, and videos shared from your favourite artists. You can comment on or love anything an artist has posted, and the artist can respond to you directly. Beats 1. Tune in to Beats 1, broadcast live from cities around the globe. Enjoy music, interviews, exclusive radio shows, and the best of what’s going on in the world of music. Beats 1 – worldwide and always on. Apple Music Radio. Radio has been completely redesigned. Play from Featured Stations, where our music experts hand select every song you hear. Or, start a new station from any artist or song. Inanition, it’s now easy to quickly return to your favourite stations with Recently Played. iTunes Store. The iTunes Store is still the best place to buy your favourite music – one song or album at a time.